Mega Sale! 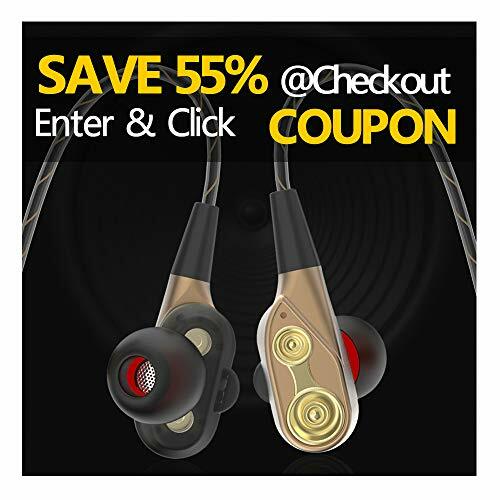 Save 24% on the Wired in Ear Earbuds/Headphones/Earphones with Dual Drivers High-Fidelity Audio+Deep Bass with Mic for Apple iOS & Android Devices from CHSMONB by CHSMONB at DJ Luu. MPN: CHS800. Hurry! Limited time offer. Offer valid only while supplies last. The CHSMONB CHS800 Dual Dynamic Drivers Headphones designed for comfort，stylish look and superior sound quality make you fall in love with music. The CHSMONB CHS800 Dual Dynamic Drivers Headphones designed for comfort，stylish look and superior sound quality make you fall in love with music. equipped with high - performance dynamic driver systems,6.0 MM*(Two Driver units) custom permanent magnet high-performance moving coil unit Exclusive tuning technology triband clear, natural, unique sensing technology to suppress high frequency glitches. Listen to your music for longer with a comfortable,secure fit that won't fall off,experience an in-ear soft gel design that adjusts to the ear for maxmium comfort. See how much easier it can be to set your workouts to your favorite songs.Order the CHSMONB CHS800 High-fidelity Headphones today! Single Button Design: Play/pause/answer/hang off/next/previous, one key operate, easy to use. Great Compatibility: Compatible with most IOS and Android smart devices by 3.5mm jack, iPhones, iPod, Tablet, iPads,smartphones,includes Siri support.